Here on the farm, we use the deep litter method with as many animals as possible. It makes for less work in the short run, but more work in the long run, especially with small buildings that are not mobile and do not allow for tractor access. Deep litter bedding means that as the animals pee and poo in their barns at night, we add enough carbonaceous material to keep things dry and keep the smell down. 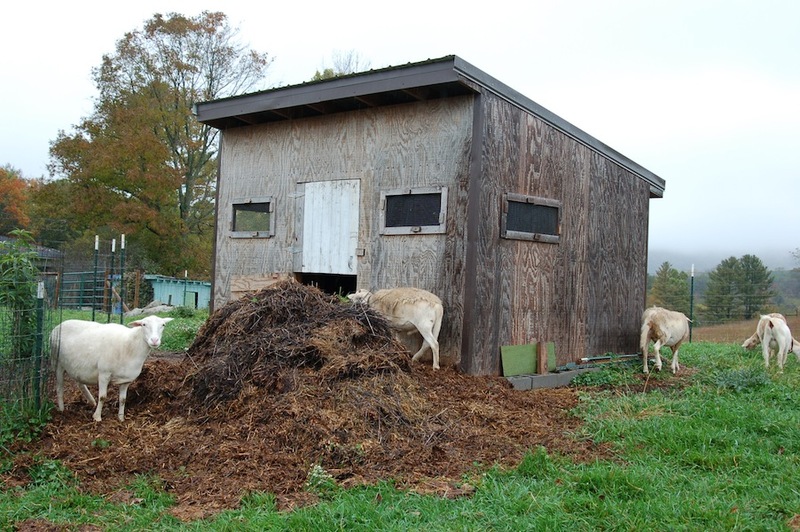 This creates an active compost within each barn building, generating quite a bit of heat. 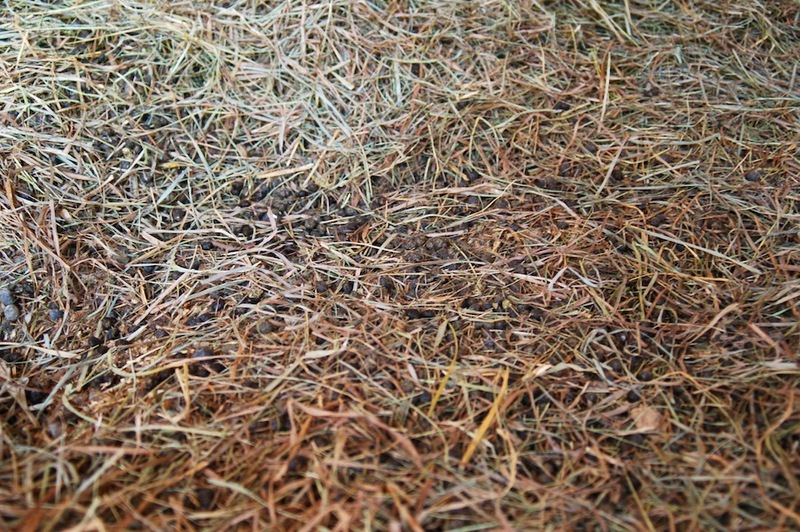 In the summer time, this means that we use more pine shavings, open more ventilation, and clean the barns out more often. In the winter time, this means we bed down lots of material and let it work its magic. 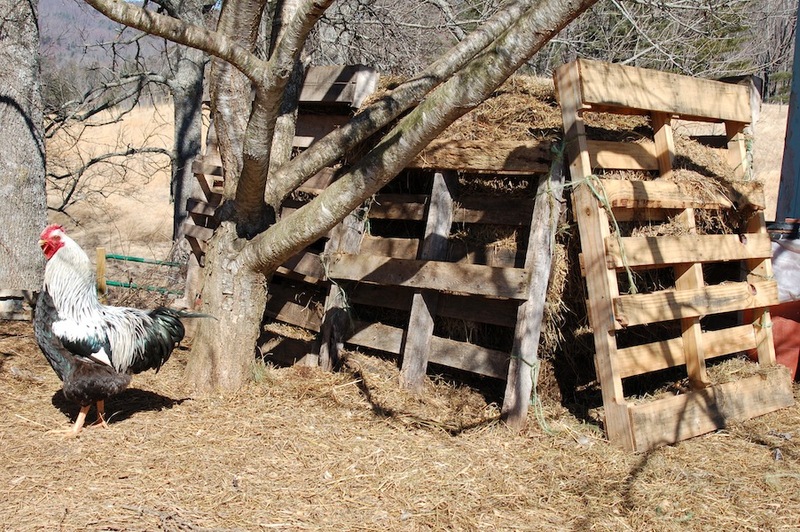 Rabbit Poop + Hay = Compost! The downside to deep litter bedding means that a few times a year, the half-composted material in the barns must be shoveled out. Each February, we do a thorough shoveling out of all the barns. The bedding is then moved into large piles or into pallet structures, where it will further compost and provide the growing medium for much of the garden. We also may spread some of the bedding back over the pastures, adding organic matter and fertilizer so that the livestock will have thicker, healthier forage. The mound of compost after cleaning out the sheep barn. 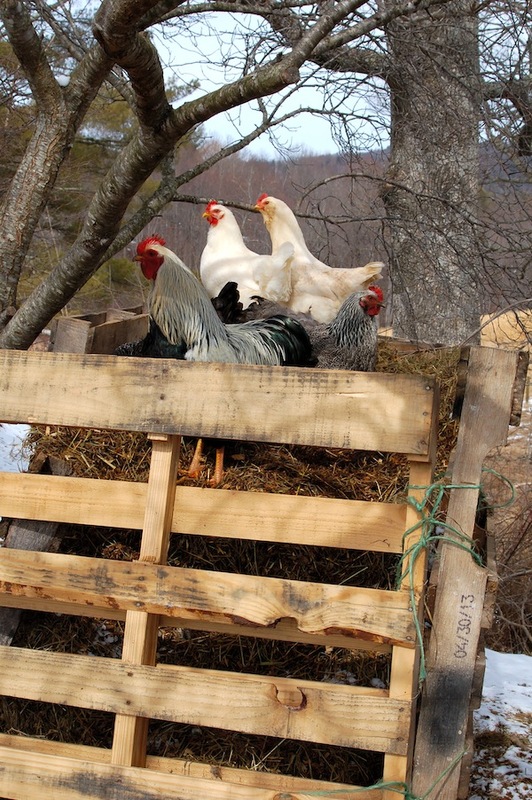 The neat part about the pallet style composts is that the chickens love to climb on the top and scratch around, providing aeration and adding their manure to the pile, thereby speeding up the process. Howdy neighbor! My hubby and I live down the road from you (in Mouth of Wilson), and we love your pork chops! We also use the DLM with our chickens, and love it! Your blog is awesome!